The Columbia River 5102N Snap Lock is a unique folder, with a design that won it the Most Innovative Knife Award at the 2004 Blade Show. It features a smooth, fast 180 degree swing deployment system, and its sturdy locking mechanism keeps it securely in place during use. Simply push down on the front lever and swing Multiple locking surfaces lock down tighter the harder you grip the handle. The subtle drop point blade shape pierces and slices efficiently with its sharp point and versatile plain edge. 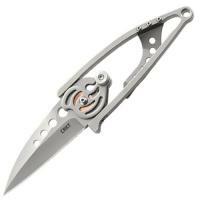 It is fully ambidextrous, with a pocket clip that can be mounted on either side of the handle. It also features a quick-release lanyard for around-the-neck carry.